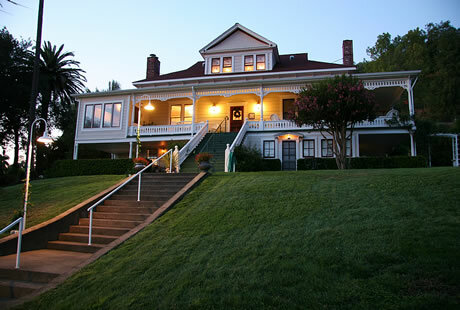 A Victorian farmhouse built around 1895, Case Ranch Inn is a registered Sonoma County historical landmark lovingly restored by the owners and opened in 2001. This beautiful inn sits on 2 acres on a country road and is a registered National Wildlife Federation Backyard Wildlife Habitat. Enjoy our large deck under the shade of our old Sycamore trees, walk in our butterfly/hummingbird friendly gardens, and enjoy your morning beverage and newspaper on our east-facing wrap-around front porch. We encourage active porch sitting and deck napping! Say hello to our two sweet miniature horses – Eclipse and Phoenix – in their pasture area by the little red barn at the back of the property. 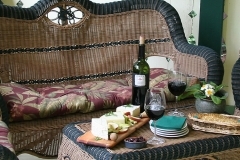 Case Ranch Inn captures the intimacy of a traditional bed and breakfast where we provide the personalized service and warm hospitality of a small country inn. Enjoy our game room/lounge and historical room opening in June, 2017, where you can relax in small, intimate settings upstairs or down, amid Victorian ambience throughout the year regardless of weather. Stroll through our rosemary hedges; wander our raised bed flowering plant/fruit tree gardens adjoining our circular rose garden with flowing tiered fountain – watering hole and bath splash for our many feathered friends; view our small vineyards that provide our signature grape juice – where you can drink zinfandel for breakfast; and see our ever-changing vegetable/herb garden. 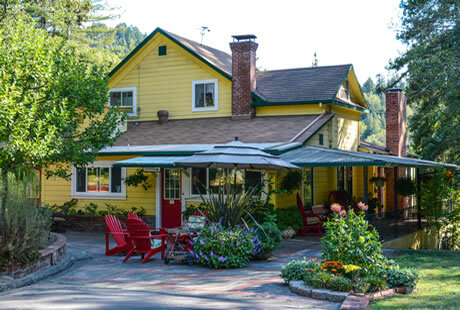 Case Ranch Inn sits in a tranquil country setting on the quiet side of Healdsburg – a place where you can relax and enjoy the Russian River Valley wine country and all its many beautiful attractions. 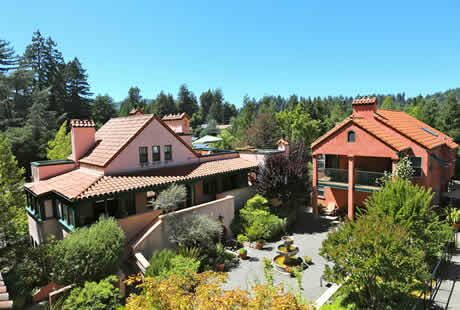 The inn is a short 15-minute drive from Healdsburg, Guerneville, Sebastopol and Santa Rosa, and a short drive along the meandering Russian River to the dramatic Sonoma Coast. 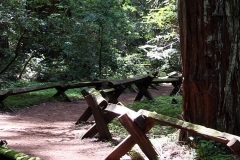 Visit our redwood preserve, Armstrong Woods State Park… a short 15-minute drive west. Ideally located for antique shopping in the many surrounding hamlets, or cycling on the many country roads and bike path. Plus … there is an onsite electric charging station for electrical vehicles. 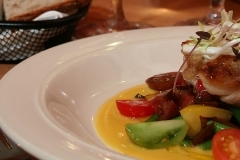 We serve a bountiful breakfast featuring organic and natural foods. In the summer/fall, fruits from our gardens and orchard – raspberries, blackberries, tree-ripened peaches, plums, pears, apples, cherries, guava, kiwi . A sample breakfast menu: organic, shade grown coffee or tea; grape juice; fresh or baked fruit serving; variety of egg dishes; pancakes/waffles/French toast/muffins/scones (many gluten-free); chicken apple sausage/bacon/ham/vegetarian meatless; even some fresh vegetables. 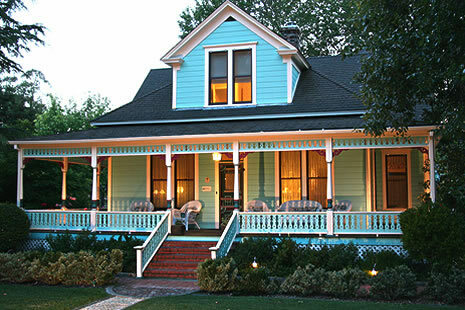 Case Ranch Inn has two guest suites upstairs in the main house and a private luxury cottage – with another guest suite in the main house and another cottage opening in June, 2017. All of our rooms welcome you with a luxury pillow-top mattress on a queen bed dressed with luxurious high quality 100% cotton sheets, comforter and matelasse coverlet color coordinated with the room decor. All rooms have spacious ensuite bathrooms with luxury robes, hair dryer, wireless internet connection, refrigerator, air conditioning, fireplace (gas in the cottages and electric in the rooms), and tv in the cottages and game room. 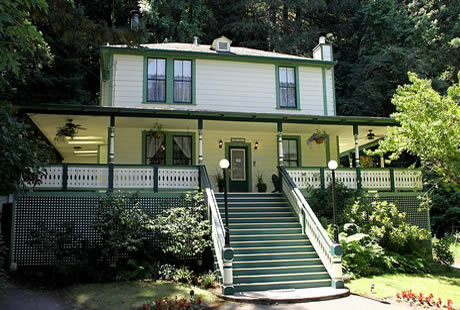 • We are an eco-friendly inn and the first and only green B&B in Sonoma County that has completed Sonoma County’s official Green Business Program. Featured in Business Environmental Alliance Newsletter for Green Practices. Plus … there is an onsite electric charging station for electrical vehicles and free parking. • Our inn offers wireless internet connection at no extra charge in every room. • Walk through our gardens and enjoy the many birds, hummingbirds, and butterflies as you sit around our fountain or relax on the deck or front porch. In the morning hours it is quite common to see our quail friends marching down the driveway. Our designation as a Backyard Wildlife Habitat means that we have planted designated varieties of plants that provide habitat for animals, birds and insects. 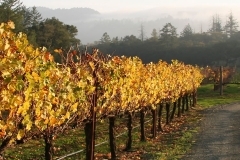 Sonoma County’s Russian River Valley has been named “Wine Region of the Year” by Wine Enthusiast Magazine. The Russian River, a southward-flowing river, drains 1,485 square miles of Sonoma and Mendocino counties in Northern California. It is the second-largest river (after the Sacramento River) flowing through the nine-county Greater San Francisco Bay Area, with a mainstem 110 miles long. The Russian River springs from the Laughlin Range about 5 miles east of Willits in Mendocino County. 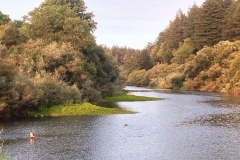 It flows generally southward to join the East Fork Russian River just below Lake Mendocino. From there the Russian River flows south, past Ukiah and Hopland, and crosses into Sonoma County just north of Cloverdale. 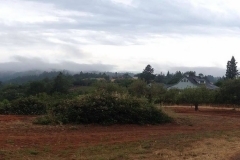 Closely paralleled by U.S. Route 101, it descends into the Alexander Valley. After it makes a series of sweeping bends, the river turns westward, where it is spanned by the Wohler Bridge, and it is joined by Mark West Creek north of Forestville, followed by Green Valley Creek to the south. 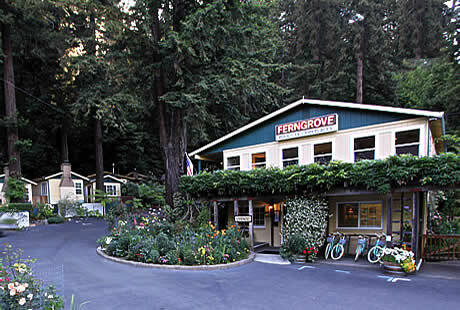 The river passes Rio Nido and Guerneville. In that area, State Route 116 parallels the river, bordering it past Guernewood Park and Monte Rio. Highway 1 crosses over the river before it flows into the Pacific Ocean between Jenner and Goat Rock Beach. The Russian River estuary is recognized for protection by the California Bays and Estuaries Policy. 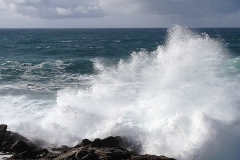 The mouth is about 60 miles north of the San Francisco Bay's Golden Gate bridge. The lower Russian River is a popular spring, summer, and fall destination for navigation and recreation. It is very safe at that time for swimming and boating, with a gentle current. The river can be dangerous in the winter, with swift current and muddy water.